CHAMP is a grass roots effort that emerged from collaboration. Recognizing the need for improved hypoxia monitoring, Gulf researchers, federal and state managers, and stakeholders met at the 6th Annual NOAA/NGI Hypoxia Research Coordination Workshop at the Stennis Space Center in Mississippi on Sept. 12-13, 2016 to develop a robust and sustainable hypoxia monitoring program. Requirements for monitoring are based on four core principles - management drivers, broad community participation, partners with multiple interests, and diversifying financial support. Subsequently eight monitoring workgroups formed representing different regions, focal areas, and management concerns, and are dedicated to constructing building blocks for CHAMP (see figure below). 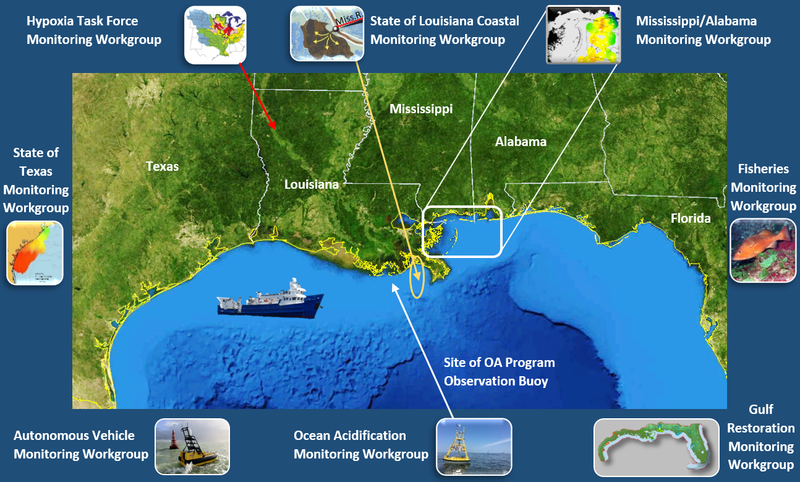 Some 60+ members strong and growing, the workgroups are integrating important assets for a Gulf-wide water quality-monitoring program encompassing hypoxia.